The digital world runs on data. So can your career. We live in a digital world — one in which examples of data science and analysis can be found everywhere. Consider your product recommendations from Amazon. Think about how companies in different industries like Boeing, Walmart, and Disney use data to drive critical business decisions, and insurance companies depend on this analysis to forecast risk or banks to evaluate loan applications. Now imagine the career potential if you had the skills to help them do it. Earn your bachelor’s in data science online from Maryville University, and you’ll do more than study the tools and techniques used to dig deeper into data. Graduates can build the skills to explore, analyze, monitor, manage, and visualize large data sets using the latest technology. Our innovative program also features a business minor, which can help prepare you for top data jobs in nearly any field. Seek to qualify for financial aid and transfer eligible credits. Stand out with a concentration in actuarial science. Why Earn Your Online B.S. in Data Science? The modern world runs on mountains of data — from smartphones to smart homes. People, businesses, and devices have become data factories that generate an incredible amount of information each day. How do we make sense of it all? Companies, institutions, and government agencies turn to data experts — individuals with the skills to interpret and translate large quantities of data into actionable insights. That’s why Maryville created an online bachelor’s in data science program to help you become a data expert with the job-ready skills to plug into any industry. Study with us, and put your numerical know-how to work through courses in Python, SQL, R, predictive modeling, and machine learning. Learn how data can be used to provide fresh business insights that are rooted in statistical theory and technical savvy. This is your chance to graduate with the knowledge and experience to analyze data trends and drive real-world solutions. Personalize your education. Consider a recommended business minor or a concentration in actuarial science. Gain real-world experience. Complete practical projects throughout your coursework. Learn from leaders in data science. Engage with dedicated faculty, who help you connect the curriculum to your career vision. The world is creating, sharing, collecting, and storing more data than ever before. That means individuals like you — aspiring data analysts with the skills to uncover insights and deliver solutions — will be critical for every organization. What’s the market outlook for B.S. in Data Science graduates? The modern business world runs on data. Yet demand for qualified data science professionals continues to outstrip the supply. That means it’s an ideal time to pursue a major in the field. In fact, Glassdoor named data scientist the best job in America, according to its 2018 rankings. And with an average of more than 2 million open jobs asking for analytics skills*, it’s easy to see why. Your bachelor’s in data science can prepare you to thrive in roles with median salaries like actuaries ($101,560), computer systems analysts ($88,270), and financial analysts ($84,300). *Median salaries and rankings data based on 2018 data compiled by the U.S. Bureau of Labor Statistics, as well as Burning Glass Technologies. Modern businesses rely heavily on data scientists to increase efficiency, reduce costs, evaluate investments, and more. That’s why the BLS projects higher than average growth for jobs like operations research analysts (27%), actuaries (22%), and computer and information research scientists (19%). According to a recent report from LinkedIn, we also know that the fields of data science and machine learning currently generate more jobs than candidates — and they rank among the fastest-growing employment areas in today’s tech industry. *Growth rates based on data compiled by the U.S. Bureau of Labor Statistics, as well as LinkedIn’s 2017 U.S. Emerging Jobs Report. Why Choose Maryville University’s Online Data Science Degree? As one of Maryville’s online data science students, you’ll learn by doing. You’ll build skills in Python, SQL, R, machine learning, and predictive modeling. Select electives that support your unique goals. Complete an optional business minor that can put you on the path to leadership. Prepare for a specialized career path with a concentration in actuarial science. Build your foundational knowledge as a data analyst through project-based learning. Additionally, you’ll access the data science program through our innovative, easy-to-use online learning platform, with technical support available 24/7. As you build your foundational skills in data analysis, you can easily collaborate with faculty who can help you apply your learning to your career goals. Maryville University has been empowering brave students like you since 1872. Ninety percent of our full-time faculty hold a doctorate or terminal degree. We’re proud of our reputation for quality academics and affordability, because it demonstrates our devotion to meeting the highest possible standards in data science education. Connect to industry-leading experts in data science. Guangwei Fan is an industry-leading scholar, published author, and passionate educator. 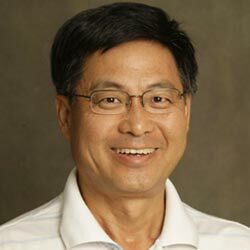 With nearly 30 years of experience as an academic leader, Professor Fan has helped many of Maryville’s graduates find work in their desired field. And now he can help you do the same. In his research, Professor Fan has investigated ways to expand how data scientists communicate with teams. In structuring our business minor, he’s helped create a professional pathway for Maryville data science students to become better equipped to lead. At Maryville, we believe that hands-on experience helps you see the practical application of your work. That’s why our data science program blends statistical theory with data technology skills through integrative projects you can complete in every course. Personalize your data science degree with a recommended business minor. There’s no question: Our data science curriculum prepares you to stand out with the skills today’s employers value. But there’s an additional opportunity for you to add a minor in business to your degree. When you look at data science through a business lens, you can apply your knowledge in a way that could change how entire organizations are managed. Excel beyond your data science degree. Your bachelor’s in data science can lead to many opportunities in your career, whether you wish to focus more on leadership, technology, or a blend of both. At Maryville, your degree can qualify you for early access to campus master’s degree programs in data science and actuarial science, so you can get a head start on your next round of studies. Master’s in Data Science, launching online in fall 2019 with high-level courses in machine learning, data mining, big data, and deep learning. Master’s in Business Data Analytics, with advanced courses in data visualization, database principles, and predictive modeling. Master’s in Business Administration, with your choice from nine concentrations, including project management, financial services, and information technology. Master’s in Software Development, with a unique blend of coding and management courses, and no business experience required. Learn more about the online bachelor’s in data science at Maryville University.